Rocco W. Ronza is a fellow of the Department of Political Sciences and adjunct professor of Geoeconomics and Politics of Multilingualism at the Università Cattolica del Sacro Cuore (USCS). 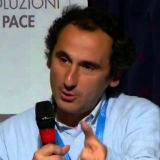 He graduated in Political sciences at UCSC and earned his PhD in Sociology and social research from the Università degli studi di Trento in 2000. He is one of the Italian leading experts of the politics of South Africa, a country which he visits regularly a researcher and a visiting scholar. He published articles on South Africa for Italian academic journals including Rivista Italiana di Scienza Politica and Stato e Mercato and regularly comments on Southern Africa's current affairs for printed media, online magazines, radios and television channels in Italy and abroad. He is a member of the South African Association of Political Studies (SAAPS) and Associate fellow at the Italian Institute for International Political Studies (ISPI) for the Africa Programme. He also worked as a communications and digital media consultant for political organizations, media agencies and community-based nonprofits. His current research interests cover South Africa's democracy, political economy and history from a comparative and global perspective; the politics of linguistic regimes; and the role of cities as cultural hubs and economic drivers in global and place development across the Global North/Global South divide.